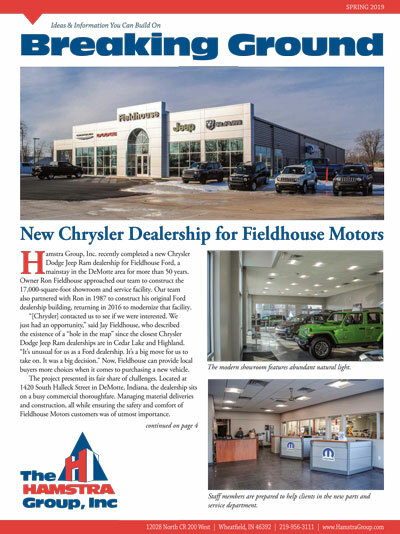 Hamstra Group, Inc. recently completed a new Chrysler Dodge Jeep Ram dealership for Fieldhouse Ford, a mainstay in the DeMotte area for more than 50 years. Owner Ron Fieldhouse approached our team to construct the 17,000-square-foot showroom and service facility. Our team also partnered with Ron in 1987 to construct his original Ford dealership building, returning in 2016 to modernize that facility. “[Chrysler] contacted us to see if we were interested. We just had an opportunity,” said Jay Fieldhouse, who described the existence of a “hole in the map” since the closest Chrysler Dodge Jeep Ram dealerships are in Cedar Lake and Highland. “It’s unusual for us as a Ford dealership. It’s a big move for us to take on. It was a big decision.” Now, Fieldhouse can provide local buyers more choices when it comes to purchasing a new vehicle. At today’s fast food restaurants, not only does the food come fast, but continuous improvement efforts also elicit frequent store design changes. 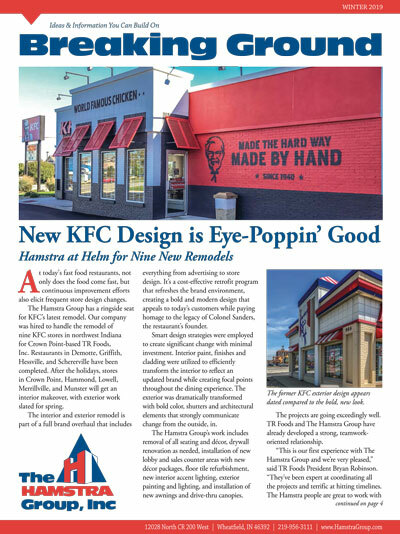 The Hamstra Group has a ringside seat for KFC’s latest remodel. Our company was hired to handle the remodel of nine KFC stores in northwest Indiana for Crown Point-based TR Foods, Inc. Restaurants in Demotte, Griffith, Hessville, and Schererville have been completed. After the holidays, stores in Crown Point, Hammond, Lowell, Merrillville, and Munster will get an interior makeover, with exterior work slated for spring. Final work is underway at the Frankfort Municipal Airport, three miles west of Frankfort in Clinton County, Indiana. 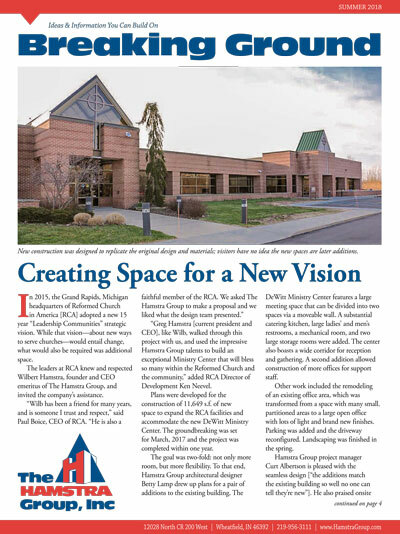 The Hamstra Group was part of the team for a $2 million building and renovation project designed to improve air transportation facilities for local businesses and the surrounding community. 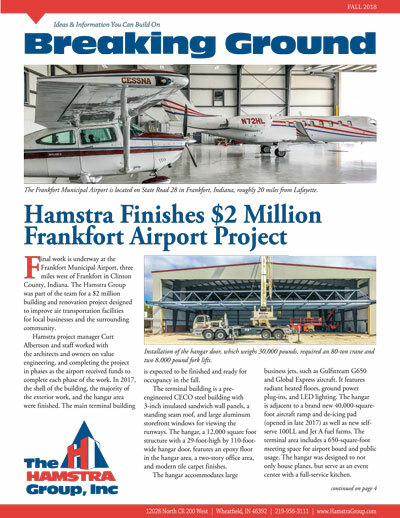 Hamstra project manager Curt Albertson and staff worked with the architects and owners on value engineering, and completing the project in phases as the airport received funds to complete each phase of the work. In 2017, the shell of the building, the majority of the exterior work, and the hangar area were finished. The main terminal building is expected to be finished and ready for occupancy in the fall. to serve churches—would entail change, what would also be required was additional space. so many within the Reformed Church and the community,” added RCA Director of Development Ken Neevel…. Larry Minter was a fresh-faced 20-year-old in 1970 when he started his career at The Hamstra Group. Karl Whitaker was a mere 17 when he was hired as a backhoe operator in 1969. Both of them were deemed old enough to work hard, but not yet eligible to vote (until passage of the 26th Amendment in 1971, the U.S. voting age was 21). 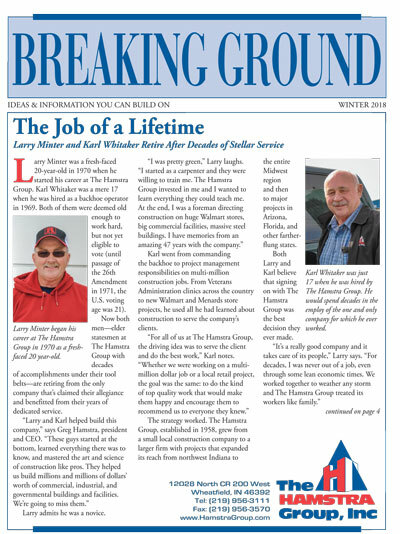 Now both men—elder statesmen at The Hamstra Group with decades of accomplishments under their tool belts—are retiring from the only company that’s claimed their allegiance and benefited from their years of dedicated service. “Larry and Karl helped build this company,” says Greg Hamstra, president and CEO. “These guys started at the bottom, learned everything there was to know, and mastered the art and science of construction like pros. They helped us build millions and millions of dollars’ worth of commercial, industrial, and governmental buildings and facilities. We’re going to miss them.” …. The Leestma Medical Clinic, an established family osteopathic medical practice located in DeMotte, Indiana, needed more space—and a brand new look. 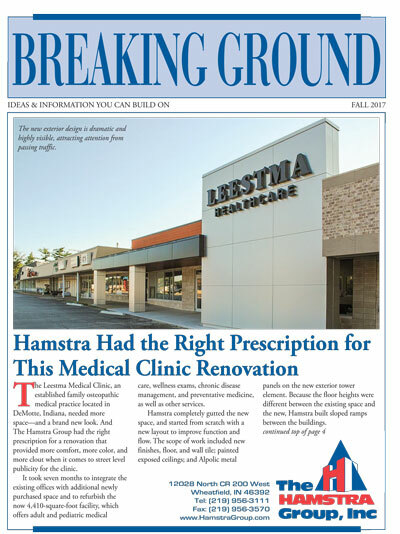 And The Hamstra Group had the right prescription for a renovation that provided more comfort, more color, and more clout when it comes to street level publicity for the clinic. It took seven months to integrate the existing offices with additional newly purchased space and to refurbish the now 4,410-square-foot facility, which offers adult and pediatric medical care, wellness exams, chronic disease management, and preventative medicine, as well as other services. 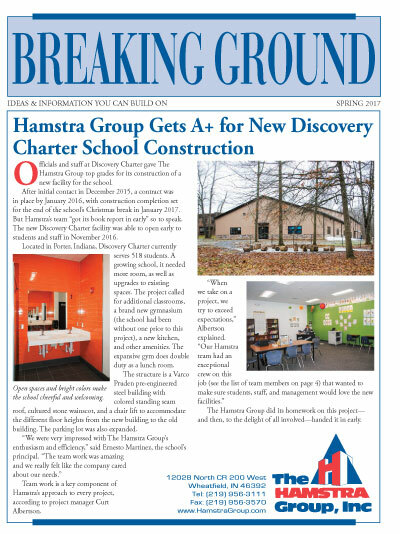 Officials and staff at Discovery Charter gave The Hamstra Group top grades for its construction of a new facility for the school. After initial contact in December 2015, a contract was in place by January 2016, with construction completion set for the end of the school’s Christmas break in January 2017. But Hamstra’s team “got its book report in early” so to speak. The new Discovery Charter facility was able to open early to students and staff in November 2016. Located in Porter, Indiana, Discovery Charter currently serves 518 students. A growing school, it needed more room, as well as upgrades to existing spaces…. 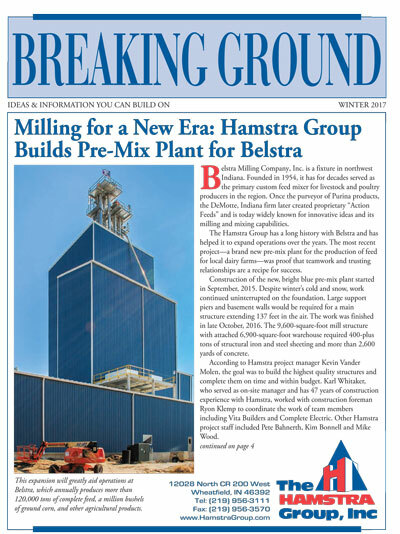 Belstra Milling Company, Inc. is a fixture in northwest Indiana. Founded in 1954, it has for decades served as the primary custom feed mixer for livestock and poultry producers in the region. Once the purveyor of Purina products, the DeMotte, Indiana firm later created proprietary “Action Feeds” and is today widely known for innovative ideas and its milling and mixing capabilities. 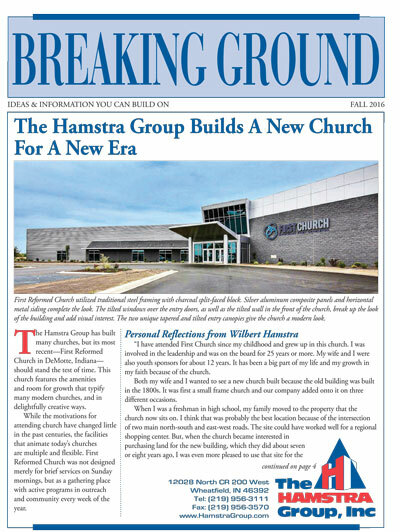 The Hamstra Group has built many churches, but its most recent—First Reformed Church in DeMotte, Indiana—should stand the test of time. This church features the amenities and room for growth that typify many modern churches, and in delightfully creative ways. merely for brief services on Sunday mornings, but as a gathering place with active programs in outreach and community every week of the year. 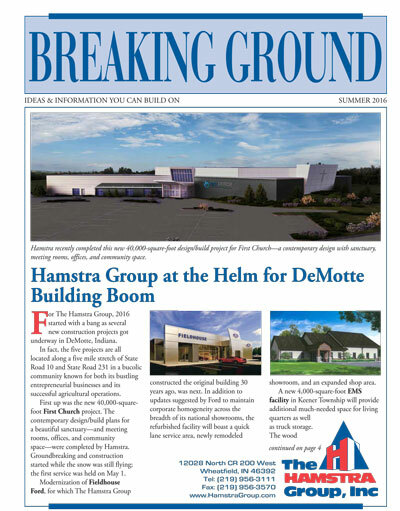 For The Hamstra Group, 2016 started with a bang as several new construction projects got underway in DeMotte, Indiana. In fact, the five projects are all located along a five mile stretch of State Road 10 and State Road 231 in a bucolic community known for both its bustling entrepreneurial businesses and its successful agricultural operations. First up was the new 40,000-squarefoot First Church project. The contemporary design/build plans for a beautiful sanctuary—and meeting rooms, offices, and community space—were completed by Hamstra. Groundbreaking and construction started while the snow was still flying; the first service was held on May 1.